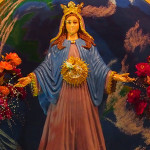 Mother Mary appeared in a splendorous light at the ‘grotto’ at the house of the Visionary Valerie, in the 4th Joyous Mystery, the 9th Hail Mary and She remained for 11min. Mother Mary came once more to prepare us on what we need to do in life on this world. A blessing for all My children in the world. I love you with all My heart. I want to teach you how to ask and how to pray so you can go forward, because there are so many obstructions in your life to reach Victory and your goals. My children, did you remember to pray every day? Prayer is the strength of your lives. Let the Holy Spirit work and guide you. Everything that is bad must be fixed in life. Don’t go on committing sin like in the past. The mercy of My Son Jesus will remain with you. Do more penitence than you can, pray novenas, go in front of the Holy Sacrament in adoration, go more to Church so you can you receive the Holy Communion, pray more within the family, fast, the sick and the elderly, take care of the children who are not easy to manage and who are growing up now, in a good manner. Kneel and do more penitence, plead and ask. My children don’t be afraid of anything to talk about My Son Jesus and His Gospel. Remain with the light and don’t enter into the darkness, because the darkness can cover you completely. Love one another and take care of each other, because when the time of the final judgement comes you will all have to remain together as brothers and sisters. Never back away from the truth, because the truth will always be there when the messages are given and the warning for the entire world. Let the shower of blessings remain on you.